Can You Give an Aging Poodle Aspirin for Hip Pain? No one likes to see a beloved family pooch in pain. Fond memories of Fluffy romping through the park as a puppy can make it that much more obvious when she starts to slow down. It's routine for us humans to take an aspirin or other pain reliever when we are sore, and it's tempting to want to provide that same relief to our pets. But put the cap back on that bottle and read on to find out why it's not such a great idea. First, determine what's causing your elderly pooch to slow down. True hip dysplasia is a congenital disorder, meaning that the dog is born with it. Standard poodles are predisposed to this disorder, though it is less common in miniature poodles. Although hip arthritis can be caused by other factors, if your dog hasn't ever shown signs of hip problems before, it's unlikely to suddenly appear later in life. Spinal arthritis, abdominal pain, constipation and even nerve damage from diabetes can also cause a dog to having difficulty getting up or walk with a stiff gait. Any of these diseases can be mistaken for hip pain to the untrained eye. To obtain a definitive diagnosis, take your aging poodle to the veterinarian. If your pupster does end up with a diagnosis of hip arthritis, your veterinarian is likely to recommend a multi-pronged treatment approach to make your dog as comfortable as possible. Pain-relieving medications may be part of the prescription, but the treatment protocol may also include glucosamine/chondroitin supplements for joint health, omega-3 fatty acid supplements, a joint health prescription diet, or even acupuncture. Low-impact exercises that build up the muscles of the thighs and buttocks, like swimming, can also help keep the hip joint stable. 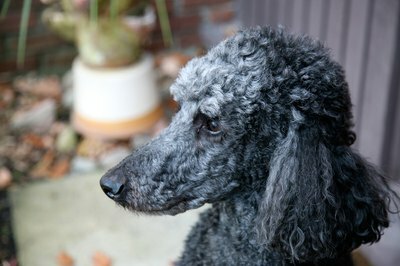 Standard poodles were originally bred for water work and often love to swim. Otherwise, treatment recommendations are not breed-specific, but may be tailored to the individual pet. Before veterinarians had safer options, aspirin was used for joint pain in dogs. Unfortunately, dogs are extremely sensitive to this class of drugs, the nonsteroidal anti-inflammatories. NSAIDs also include common human pain relievers like ibuprofen and naproxen, which are extremely toxic to dogs and cats and should never be given to them. Side effects of NSAIDs in dogs include stomach ulcers, liver damage, kidney damage and blood clotting problems. Tylenol should be avoided as well. Because of the frequency and severity of these side effects, newer NSAIDs were developed specifically for pets. Some of these include carprofen and deracoxib. These can still cause side effects if not dosed and monitored carefully, but are much safer when used properly. Your veterinarian may also add in non-NSAID pain medications like tramadol, gabapentin and amantadine, to reduce the dose of NSAIDs needed. If your elderly furbaby is put on an NSAID medication to manage chronic pain, your veterinarian is going to need to check him frequently to ensure that no liver or kidney damage is occurring, and to determine if your pet needs additional pain relief. Don't skip your rechecks! Overall, never give Fluffy any medication, especially formulas prepared for humans, unless it has already been approved by your veterinarian. Breed Predispositions and the Annual Wellness Exam, Dennis F. Cloud, DVM. Western Veterinary Conferece Proceedings, 2006. An Update on Nonsteroidal Anti-inflammatory Drugs (NSAIDs) in Small Animals. Vet Clin North Am Small Anim Pract. November 2008;38(6):1243-66, vi. Hillary Lynn is a veterinarian with experience in small animal medicine, zoological and aquatic medicine, animal behavior and animal welfare science. She is a consulting veterinarian in the pet nutrition industry and an editor for several medical editing firms. Lynn's work has been published in the "Journal of the American Veterinary Medical Association" and the "Journal of Herpetological Medicine and Surgery."